I don’t often post about unfinished garments but I don’t think this one will ever be finished. 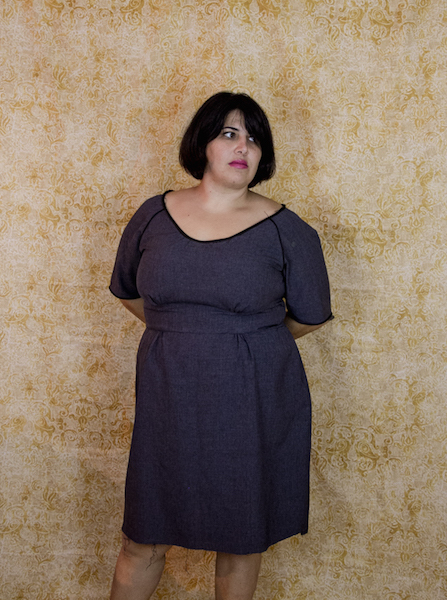 I ordered Colette Patterns new dress Dahlia during the prelaunch sale, because I loved the plaid version. But I wasn’t quite sure it would look that good on me. I normally do an FBA on everything, but looking at the sizing and the gathers in the bodice I decided to cut a straight size and see how it went. I had 3 yards of a poly suiting in my stash and I picked up the zipper and bias tape at Joann. I also got some piping because I thought it might look cool in the raglan seams. My hope here was to make a wearable muslin that was more wearable than muslin. That’t didn’t happen, mainly because that fabric frays like crazy! In the end I didn’t feel it was worth redoing seams that will probably just unravel again. I do think the style actually looks pretty good so it wasn’t a wasted effort. Here’s what I learned for when I make a real version. I don’t really love the piping in the raglan seams, but I did learn something from that too. Next time I’ll use wash away Wonder Tape. The first seam I pinned and it came out wonky and then I had the brilliant idea to use Wonder Tape! So the second (and third and fourth) piped seams came out great. So now I am on the hunt to find a nice weight wool plaid. I think a red/black buffalo check would be perfect. If anyone spots that in Portland – let me know! Shame it unravelled so much, the colour suits you and I love the piping. I had a similar problem with mine and wondered if I should shorten the back, but a kind blogger suggested I wear a cardigan! I suppose it depends on your climate, it’s pretty cool here so I need one! Good luck with your fabric hunt. 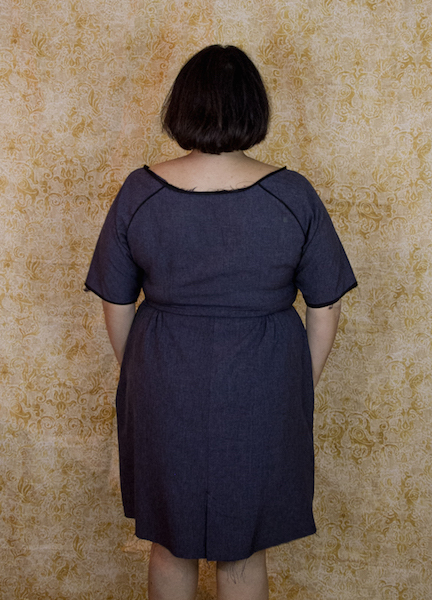 I was going to leave a similar comment to Thumberlina–it’s a shame you aren’t finishing it, because I think it looks really great on you–the fit, colour, and especially the neckline are really flattering. I’m trying to figure out if this pattern would work in a knit fabric. Cat Lady Sewing Challenge – Katmono!